World Fishing Day was established to encourage families to hit the water together, unite the fishing community, bring new people into the sport and highlight the positive changes fishing can have in peoples' lives. The folks at Fishing TV have pieced together an exciting concept to share a live feed of anglers chasing iconic species in 24 locations throughout the world, and it should come as no surprise that one of their premiere locations is none other than Alaska. With five species of wild Pacific salmon, steelhead, trophy rainbow trout and abundant Dolly Varden, arctic char, grayling and much more – we know Alaska is special when it comes to fishing, whether you fish with a rod and reel or net. It's no surprise that residents and visitors alike flock to rivers this time of year – supporting two of the three largest economic pillars in our state: fisheries and tourism. The sportfishing industry alone supports more than 1,100 business, employs more than 2,500 fishing guides (87 percent of whom are Alaskans), and contributes $1.4 billion to our economy every year. If you aren't familiar with the plight of wild salmon outside of Alaska, you might not realize just how lucky we are. Other states spend millions each year to fix wild salmon habitat, restore adequate flows of water in their rivers, and move fish around large dams. They are struggling to maintain wild salmon populations at fractions of their historic size. In the last 100 years, more than 400 runs of wild Pacific salmon and steelhead have been killed off along the west coast, a primary cause of which is habitat degradation. By comparison, Alaska is in relatively good shape, but the threats are stacking up and warning bells are sounding. Emergency Orders have been issued closing many fishing areas in southcentral and southeast Alaska to protect weak returns of king salmon. The proposed Pebble mine, planned atop and near streams essential to supporting Bristol Bay's massive runs of salmon, is on a fast track to obtaining a major permit from the Army Corps of Engineers. New science increasingly confirms that ocean competition between wild and hatchery salmon is impacting southcentral Alaska's wild salmon runs. On Prince of Wales Island in Southeast, hundreds of culverts are impeding fish migration. In British Columbia, along rivers that flow into southeast Alaska, a series of massive mines put the area's fisheries and economy at significant risk. Protecting fish habitat and expecting responsible development of our natural resources is one easy way Alaskans can work together to safeguard our fisheries, support our economies, and protect our fishing heritage. Unfortunately, as Alaska grows at a fast rate, the primary law guiding development near salmon streams is woefully out of date, doesn't reflect new scientific information, and doesn't provide a way for individual Alaskans to provide input about projects that could be built in our important fishing rivers and hunting areas. Most of you are probably already planning on doing the first: Celebrate World Fishing Day by hitting the water and being grateful for the unparalleled fishing resources that the spawning beds of our bountiful Alaskan rivers provide. Then, I ask you to go one step further and support efforts to protect fish habitat. Ask our state leaders to push back on ill-conceived projects like the proposed Pebble mine that irresponsibly risk our fishing, communities, and culture. Support the salmon habitat ballot initiative this November to improve the laws guiding responsible development and tell others to do the same. Participate in a river clean-up day on your favorite fishing river. Recently, our 6-year-old son drew a picture of a giant, toothy bright red salmon jumping out of a clear blue river. He captioned it, "In Ulaska u tak car of samin." Allow me to translate: "In Alaska, you take care of salmon." I think he just might be onto something. If we follow this advice, we will continue to feed our economy and families, support thousands of jobs, and maintain the fishing and hunting opportunities so many of us enjoy. 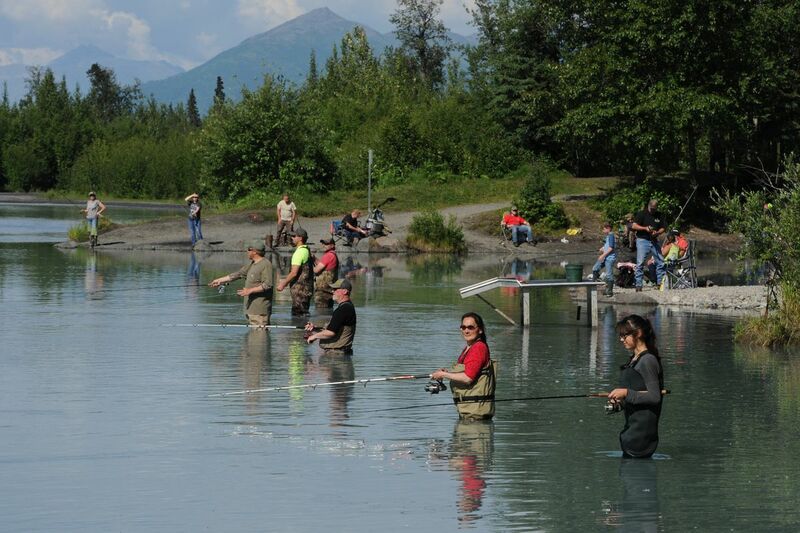 That sounds like a bright future for Alaska and something to keep in mind this World Fishing Day and beyond. Nelli Williams lives in Anchorage with her husband and two young children and is the Alaska Director for Trout Unlimited.